Biography of the Russia's Greatest History Painter. State Russian Museum, St Petersburg. The Siberian Cossack painter Vasily Surikov, along with Ilya Repin (1844-1930) is one of the greatest ever Russian artists to explore the genre of history painting. Based in Moscow, he travelled to Northern and Southern Russia, as well as to Italy, Germany, France and Spain. He was a member of the progressive artist group known as The Association of Travelling Art Exhibitions (aka The Wanderers, or Itinerants) and was frequently represented in their exhibitions. While Surikov's main contribution to Russian art is his series of large-scale historical canvases, he also painted landscapes, portraits, and watercolours. Patronized by several art collectors including Pavel Tretyakov (1832-98), and Savva Mamontov (1841-1918), his greatest masterpieces include narrative works, like The Morning of the Execution of the Streltsy (1878-81, Tretyakov Gallery, Moscow), Menshikov at Beriozov (1883, Tretyakov) and The Boyarina Morozova (1887, Tretyakov); portraiture, like Portrait of Unknown Girl Against a Yellow Background (1911, Russian Museum, St Petersburg) and Man with an Injured Arm (1913, Russian Museum); landscapes, like Zubovsky Boulevard in Winter (Tretyakov), and genre works like The Taking of the Snow Fortress (1891, Russian Museum, St Petersburg). Vasily Surikov, see: Modern Artists. Pioneer critical realist genre painter. Genre painter in critical realist style. Born in the remote Siberian town of Krasnoyarsk, of Cossack ancestry, Vasily Ivanovich Surikov grew up in the extreme conditions typical of the region, as a result of which he felt strong personal links with the people and history of Russia. His natural aptitude for drawing and painting was noticed at an early stage by his school teacher, N. V. Grebnev, who gave him individual tuition. After completing school in 1868, Surikov travelled on horseback to St Petersburg in order to join the Imperial Academy of Arts, a journey which took him almost 12 months. In 1869, he entered the Academy of Art, where he worked hard for six years under the pedagogue Pavel Chistyakov. An early work from this period is The Knyaz's Court of Law (1874). After graduating from The Imperial Academy, Surikov obtained commissions for 4 large-scale fresco paintings for the Cathedral of Christ the Saviour in Moscow, where he now settled. He also quickly found a wife, Elizabeth Charais, granddaughter of the Decembrist Svistunov. The old Muscovite architecture, embracing the Kremlin, Red Square and numerous cathedrals and monasteries proved an immediate inspiration to the young artist. It wasn't long before he began painting his greatest masterpiece The Morning of the Execution of the Streltsy (1878-81), a work which would define the main focus of his painting  namely, the depiction of Russians in turning points of their history. Like many other Russian artists of the 1870s and 1880s, he was especially fascinated by the Petrine era (the reign of Czar Peter the Great), which was an important period of national development and cultural progress. 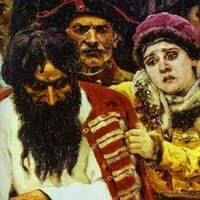 This period also witnessed a conflict between the rights of the individual and the power of the state, a theme which provides the main drama of both The Morning of the Execution of the Streltsy and The Boyarina Morozova (1887). In the former, Peter the Great stares with angry vengeance as members of the Streltsy - an early type of militia - are led to their execution by the Kremlin walls. In the latter, a noblewoman, an Old Believer is being dragged away on a sledge to face punishment for her heretical beliefs. In both pictures, Surikov highlights the emotions of those caught up in the action and the impact of history on their lives. Surikov's third major historical work is Menshikov at Beriozov (1883). This portrays the Siberian exile of Peter the Great's favourite courtier after the death of the Czar. A once all-powerful politician, now disgraced, Menshikov continues to impress the viewers with his strong personality. During the early 1880s, Surikov was active in several different artistic circles. He joined the Itinerants (Peredvizhniki) movement in 1881, and also attracted the attention of the famous Russian art collector Pavel Mikhailovich Tretyakov (1832-98), who bought both the Streltsy and the Menshikov paintings. With the proceeds, Surikov went abroad, visiting Germany, Austria, Italy and France, where he studied the Old Masters as well as famous contemporaries of the 19th century. Tragically, in 1887, not long after Surikov completed The Boyarina Morozova, his wife Elizabeth died, leaving him bereft. He stopped painting and left Moscow with his children for Siberia. Here, to help Surikov recover, his brother urged him to paint a picture of the "storming" of a snow fortress - a Cossack tradition which was still celebrated in Krasnoyarsk. The result was The Taking of The Snow Fortress (1891), the most light-hearted of all his works. He followed this, on his return to Moscow, with a number of portraits, watercolours and another serious history painting, The Conquest of Siberia by Yermak (1895, Russian Museum, St. Petersburg). The latter depicted the 16th century battle between the Cossacks, led by their Ataman Yermak Timofeevich, and the army of Kuchum-Khan, the ruler of Siberia. Two of his last such narrative paintings were Russian Troops under Suvorov Crossing the Alps (1899) and Stepan Razin (1906), both in the Russian Museum, St Petersburg. Some of the material for these pictures was collected during his trips to the Cossack homelands around the Don river, as well as the lower Volga and the Crimea. In 1893 he was elected a member of the Imperial Academy of Arts. Surikov died in Moscow at the age of 68 and was buried at the Vagankovskoye Cemetery. For a brief review of the era, see: Russian Painting, 19th-Century. Together with his contemporary Ilya Repin, Vasily Ivanovich Surikov took historical or narrative painting to an entirely new level. His pictures are filled with active portrayals of ordinary people caught up in the drama of the moment, and demonstrate enormous skill in the arrangement of crowds, the movements of people, and linear perspective. 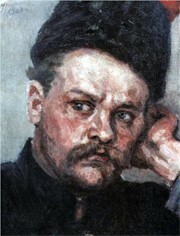 Amazingly, despite his reputation as Russia's greatest historical painter, Surikov produced only nine historical works. Most of his painting consists of portrait art, including group portraits and self-portraits, landscapes and genre-scenes. Today, Surikov's pictures hang in the best art museums across Russia, Belarus and the Ukraine, including the Museum of History of Religion and Atheism of the Academy of Science, St. Petersburg, the Ryazan Art Museum, the Art Museum of Belarus in Minsk, the Museum of Fine Arts in Kharkov, the A. N. Radishchev Museum of Arts, the Museum of Fine Arts in Omsk, and the Far East Fine Arts Museum in Khabarovsk.